October 2012, Best Non-D Related Post. I’m grateful! To view some of the other FANTASTIC blog posts, please visit Diabetes Mine. Hi, my name is Babs and I’m an extrovert. Talking-incessant conversation, with anyone, anywhere, about anything, or nothing at all. I process everything verbally. I talk about my pain, my fears, my beliefs, my failures, my sorrow, my joy, my happiness, my surprise, my love, my anger, my hurt, my confusion. . . .all of it. In talking through each of these, I find solutions. As others join me in conversation, I get new perspectives, ideas and answers. I like you to share YOURs as well, because the load feels lighter when more people are sharing it. I share my excitement, not to brag, but so you can own it too and celebrate with me. I am energized by people and their conversation, laughter and presence. This has never been more obvious to me than last Friday. I went to my Drs. appointment and literally felt like I couldn’t make it through the day. I had some pain, but not overwhelming. It was more of an emotional drain that I’d been home, alone for many days. She refused to release me to return to work. I was heartbroken. We stopped by my office to let them know and within 20 minutes of talking to my co-workers, I was laughing, planning my return, and feeling like a whole, new person. I feel that conversation is just as much a gift, as a pearl necklace. Conversation is the physical representation of pulling your heart and your soul out of your chest and handing it to the person you are with. I can’t imagine having a friendship without being able to bare your souls to one another. I long for the kind of friendship in which we look across the room at one another and know what the other person is thinking. I’ve had that a few times. . .it was glorious! I miss them. However, as I’m aging, I’m learning from my borderline introvert husband. He loves a good conversation. He can work a room as well as any politician. He laughs with great gusto (one of his most endearing features, I might add!) But, he does need his alone time. After a large gathering, he needs to come home and rest. He is energized by the quiet. So, on behalf of Extroverts Anonymous everywhere. . . take us or leave us, but let us talk it out first. We may convince you to hang around a little longer. . .even if it’s just to hear one more funny story. I hope you can find some other redeeming feature in our personality that keeps us close to your heart, even when we won’t shut-up. If it’s too much for you. . .maybe you can introduce us to someone else you know with “Extrovertis Mouthitis” and we can form a support group. Personality types, while very helpful at times, can be damaging to relationships. I’m reading a book called “Introverts in the Church” by S. Adam McHugh right now. I have really struggled with finding a church that I like and feel comfortable in, because I am very much an introvert. This book is giving me some insight as to how I can set appropriate, energy-saving boundaries for myself in a church setting without coming across as aloof, pretentious, or closed off. Most of our society is built with extroverts in mind, and it often leaves introverts feeling like there is something wrong with them. Unfortunately this means that introverts can hold grudges against extroverts because of the dramatic differences in processing methods, energy resources, etc. It sounds like the post you read was written by an introvert who has had her feelings hurt in the past by people who have failed to understand her personality mechanism, for lack of a better word. Unfortunately, I don’t have any suggestions for how to alleviate the miscommunications that occur between introverts and extroverts. I suppose just being more mindful, like you are striving to be, of where people gain energy is a great starting place. Also, realizing that introverts do not hate other people and do not have social phobias (well, some might, but that is not a categorizing characteristic of an introverted personality), just as extroverts are not flippant and unable to be by themselves. That’s funny because I always felt like the odd one out. When I think of many of my acquaintances, most of them are introverts and I’m the loud, boisterous, annoying one. Thank you for your reply and the interesting perspective. I didn’t say it in the post, but what really was hurtful about the other blog post, was that she complained about how very annoyed she was with this “Extrovert”, but when she was in trouble and the “Extrovert” stepped in to help her, she decided she like her. Then again, she became annoying until they found out that “Extrovert” had cancer. I hope people in my circles of influence aren’t so fickle with my heart. It’s just too painful. BTW, to my other readers. . .Brenna is one of our four brilliant, beautiful daughters, and, she actually READS my blog! BONUS! Believe it or not (and most people don’t), but I am an introvert. I administer the assessment, so I know my results are accurate. I can be just as loud and outgoing as you, but I need (what I like to call) “Sara time”. And if you think it’s noisy to be around an extrovert, try being INSIDE an introvert’s brain! I say about 1/4 of the things I think. Yikes! Sorry a post out there hurt you, but I’m really glad it wasn’t one of mine! Thanks Sara! So, you still have the conversations, just not out loud? 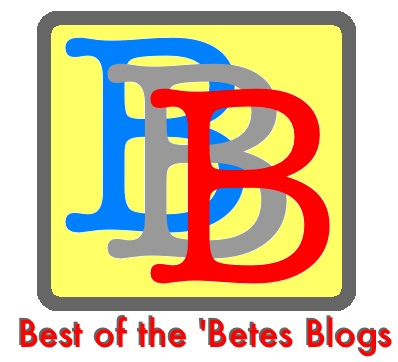 Thank you SO much for awarding this post a “Best of ‘Betes Blogs” award!